Ascension Conner Sutherland has been alone for a long time. He can't remember the last time he even felt the desire to be touched by another man. Sometime before his death, when he'd still been Laine's lover. But Laine had found Severo years ago, and if any two people were meant for each other it was Laine and Sev. Where that leaves Conner, he doesn't know, other than feeling lost and out of sorts. He doesn't want to think about the way he feels when he sees Ro-Rogelio, Sev's nephew. Conner's seen Ro grow from pretty boy into a handsome man, but wanting him is foolish and useless. Ro's got a life to live, and even if he does things that hurt Conner, that's not Ro's fault. He doesn't know he entranced Conner long ago. Whirlwind Stefan wasn't physically perfect in life, and his search for someone to love him resulted in his murder. Now he's been dead for years, and he's lonelier than he ever was when he was alive. His physical problems might have vanished when his body ceased to live, but his spirit has to deal with the memories of the past. Jordan and Gideon are friends who share eager guys when they can find them, but being in a war zone hasn't allowed for that to happen often. One roadside stop puts an end to their lives. Jordan and Gideon are at a loss to understand what happens to them, why they stay behind when others go up into the light. 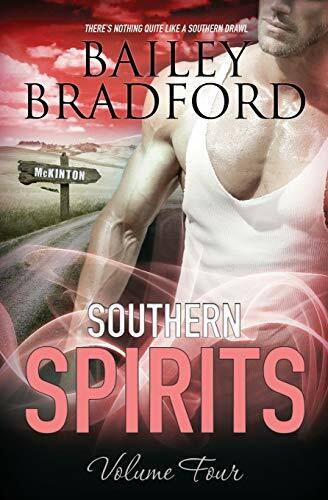 Searching for answers, they head to Jordan's hometown-McKinton, Texas-but a hell of a lot of things have changed in the decade and a half since Jordan left. Namely, the arrival of one wicked, joyful spirit named Stefan. A native Texan, Bailey spends her days spinning stories around in her head, which has contributed to more than one incident of tripping over her own feet. Evenings are reserved for pounding away at the keyboard, as are early morning hours. Sleep? Doesn't happen much. Writing is too much fun, and there are too many characters bouncing about, tapping on Bailey's brain demanding to be let out. Caffeine and chocolate are permanent fixtures in Bailey's office and are never far from hand at any given time. Removing either of those necessities from Bailey's presence can result in what is know as A Very, Very Scary Bailey and is not advised under any circumstances.